We already know that LG G5 is now receiving official stable Android 8.0 Oreo firmware. The Korean variants of LG G5 have already received Oreo update along with the KDZ downloads. International variant or the global variant of LG G5 H850 may also get similar update soon. Now that LG V40 launch is near, LG is rolling out Android 8.0 OTA for many of its previous flagship phones to boost sales. This includes the LG G7, LG G6, LG V30 or V30 Plus. The latest ones to receive Android 8.0 Oreo are the Verizon and T-Mobile LG G5 phones. Both Verizon LG G5 VS987 and T-Mobile LG G5 are receiving Oreo. T-Mobile LG G5 gets a new firmware build number H83030c. We have listed the full KDZ firmware files along with the TWRP flashable images for the same. Thanks to autoprime, a recognized LG developer, we can now flash the Oreo update via TWRP recovery as well and thus retain root access. Moreover, if you like to retain the original stock firmware and do not want to void warranty, then you can flash the full stock KDZ firmware from below. So hit the download section below and grab the latest KDZ files for T-Mobile. Verizon LG G5 KDZ will be updated soon. So stay tuned. Note: TWRP Flashable zip file is a 100% stock untouched system, boot, modem, and bootloader. Recovery is not included so you don’t lose TWRP. How to update Verizon and T-Mobile LG G5 to Android 8.0 Oreo? The Verizon and T-Mobile LG G5 Oreo updates are now live across the globe. 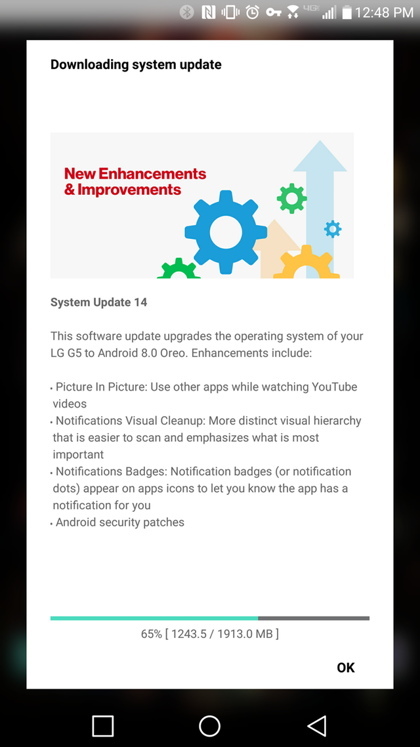 Upgrade using LG Bridge is the official way to update any LG phone. All you need to do is install the LG Bridge software on your PC or Macbook and conned the G5 device using a USB cable. If the update is available, you will be prompted and the phone will upgrade by itself. Download and install the LG Bridge software for Windows or Mac. Run the LG Bridge tool as administrator. Now connect your LG G5 to PC via USB cable and keep the device booted. LG Bridge will detect and create a connection. Install if any update is available. If you are looking forward to installing the Android Oreo update on LG G5 using the official KDZ file, then you will need to download the full stock KDZ firmware from above. If you intent to keep your Android phone rooted and Bootloader unlocked, then flash the TWRP flashable zip via custom recovery. This is because, once you update to Oreo using the KDZ file, you may not be able to unlock the bootloader, install a TWRP or flash a SuperSU package because the Android 8.0 firmware may not allow it.